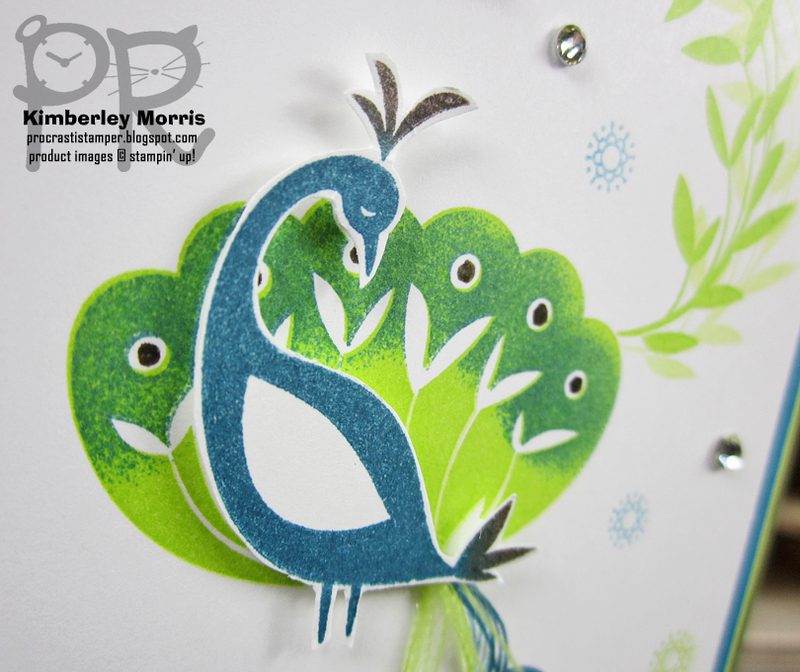 Less Than 10 HOURS LEFT to Sale-a-Brate and get FREE STAMPS! You're running out of time!!! These FABULOUS Deals are GONE on March 31st at 11:50pm MT! you still have time to get FREE STUFF when you SHOP, or JOIN! CHECK OUT THE FREE STUFF YOU CAN GET!!! Note: $50 & $100 increments are before tax/shipping, you can mix and match Level 1 & 2 items, if your order is $150 or more you should NOT use the MARCH Monthly Perks Code: VY4HE7DB, as you will have earned additional FREE Stampin' Rewards to redeem on your own! 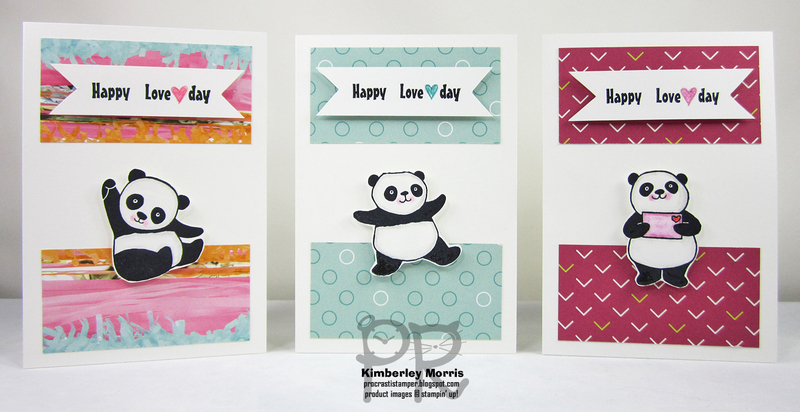 Check out this Livestream I did yesterday on my Facebook Business Page...see how easy it is to CRAFT WITH PANDAS! 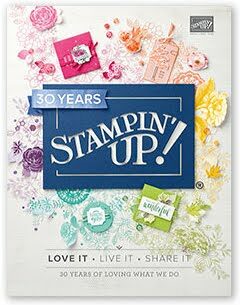 JOIN MY TEAM and Get (2) FREE STAMP SETS*!!! 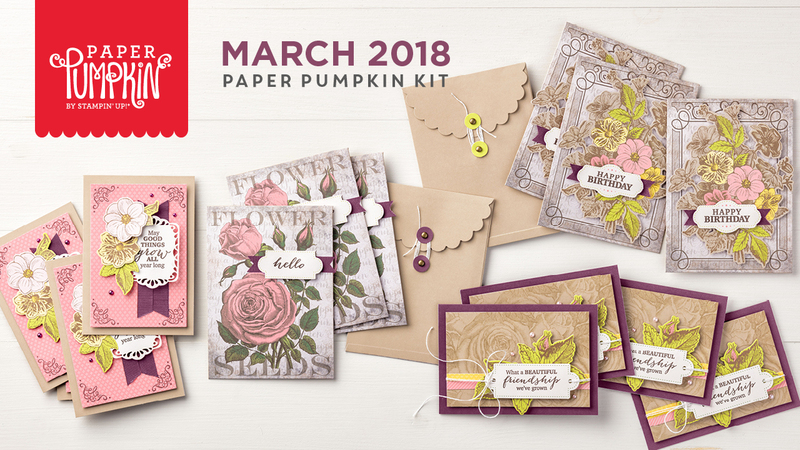 *Two FREE stamp sets (value up to $101) with $99 Starter Kit order only available when you join by 11:50pm MT on March 31st, 2018. The Starter Kit has FREE Shipping, though you will be assessed tax on your order for your area. 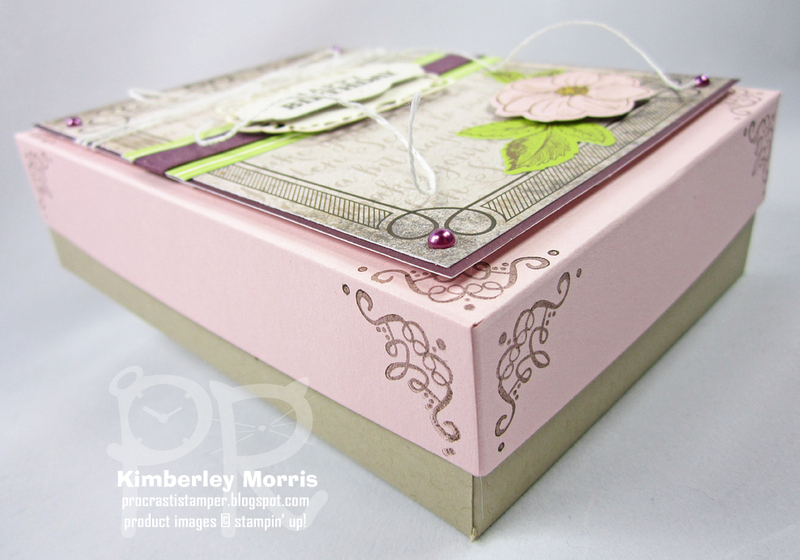 As usual, I tried to stick closely to the Paper Pumpkin kit supplies, though I chose to add some Crumb Cake Card Stock, Powder Pink Card Stock, and a wee bit of the Myths & Magic Washi Tape and some 2" x 8" Cello Bags for some of the items inside the box (though you might have different contents in mind, so you may not need those). Everything else, including the adhesives, came from the kit! I made a box for a birthday gift, as well as a Mother's Day card. Oh, and just a note on the plastic test tube I used for the bath salts inside the package...those actually came from a Paper Pumpkin kit from a long time ago. 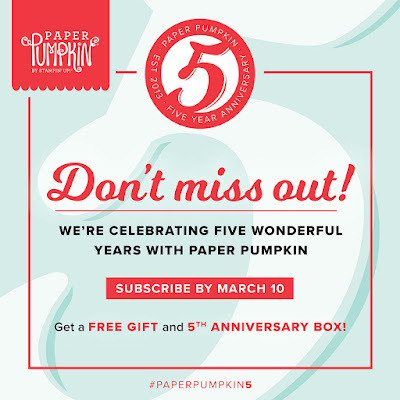 But right now, you can actually still get SIXTEEN of them in either the Paper Pumpkin September 2016 Good to Eat FULL KIT or the REFILL KIT (includes consumables only), if you are registered as a Paper Pumpkin Subscriber. 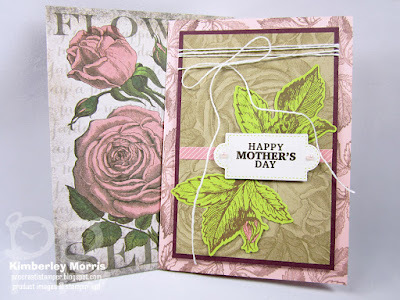 I'm really not the "vintage" stamping type, but this kit made it SUPER easy! 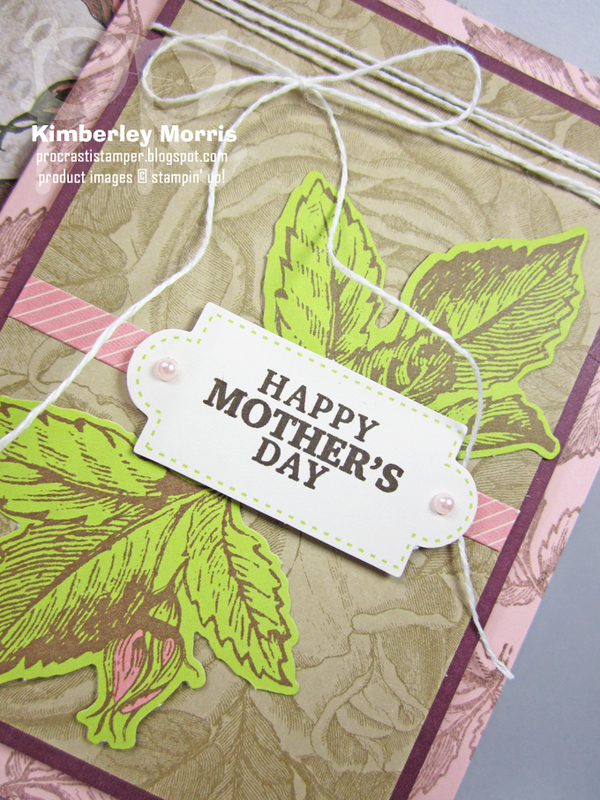 For my card, I assembled one of the string closure envelopes according to the kit directions, but I made my own card base to fit inside. 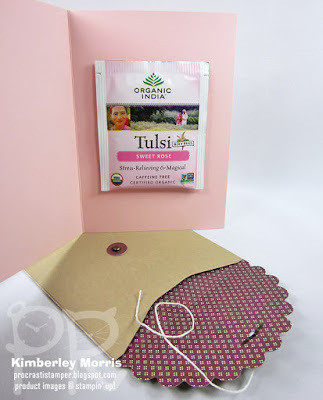 And my card has a little treat in it--a packet of my favorite Tulsi Sweet Rose Tea! The May Good Things Grow Refill Kit can now be purchased the on the PAST KITS page in my Online Store. There are sometimes full Kits available on that page, but many are just Refill Kits which include the consumables only...meaning everything but the stamp set & ink pad. By the way, you're gonna have to be a Paper Pumpkin subscriber to buy whatever's available on that PAST KITS page, so go ahead and sign up HERE to get your email address in the system first! 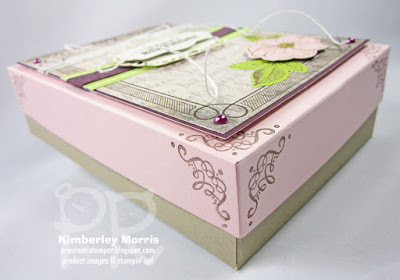 Stampin' Supplies: May Good Things Grow Paper Pumpkin Kit, Crumb Cake card stock, Powder Pink card stock, Myths & Magic Washi Tape, 2" x 8" Cello Bags (for some of the packaging inside the box), Paper Snips, Stampin' Trimmer (for trimming and scoring). 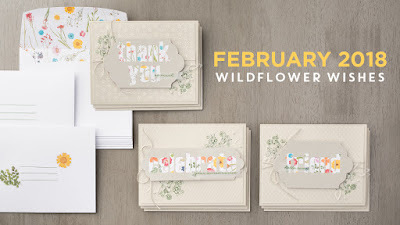 You still have TWO MORE DAYS to qualify to earn FREE STAMPS (and other select items) with Sale-a-Bration when you shop my Online Store through March 31st...that includes Paper Pumpkin Prepaid Subscriptions! 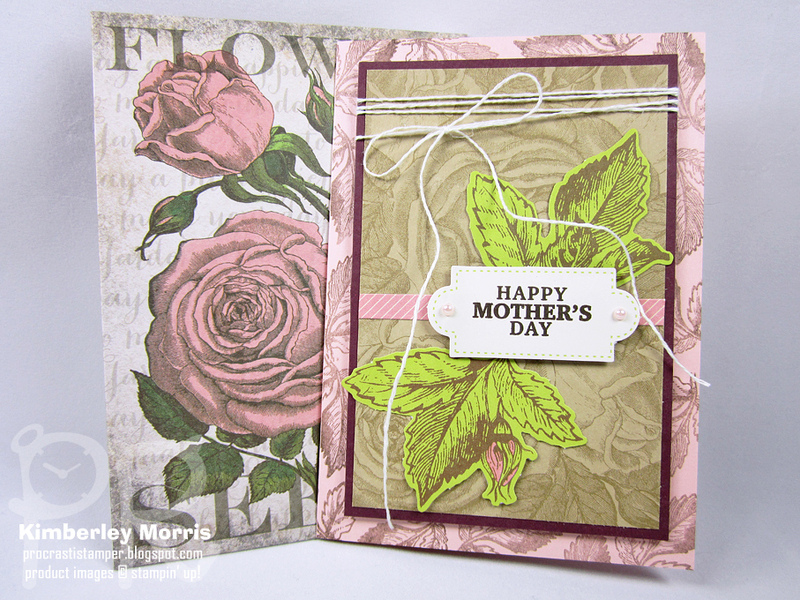 I had a card class at my local library branch yesterday...was free for patrons...and we made 4 different cards. 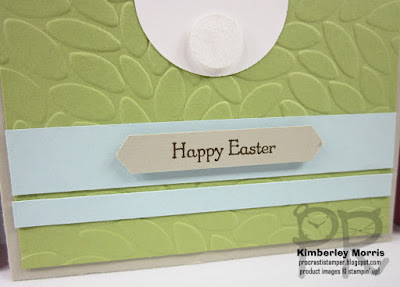 I'm sharing this one first since it's so close to Easter, although this card can be made with a variety of greetings, via the Teeny Tiny Wishes stamp set (available in wood-mount, clear-mount English, or clear-mount French) and coordinating Classic Label Punch. In my class, I offered 4 different greetings for this card: Happy Easter, Hello Baby, Thinking of You, and Friend to Friend. 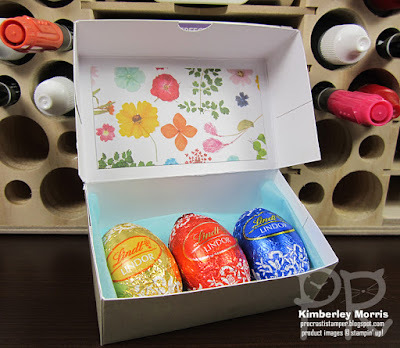 They are included amongst the 24 greetings in the Teeny Tiny Wishes stamp set, and all the greetings in that stamp set fit in the Classic Label Punch. 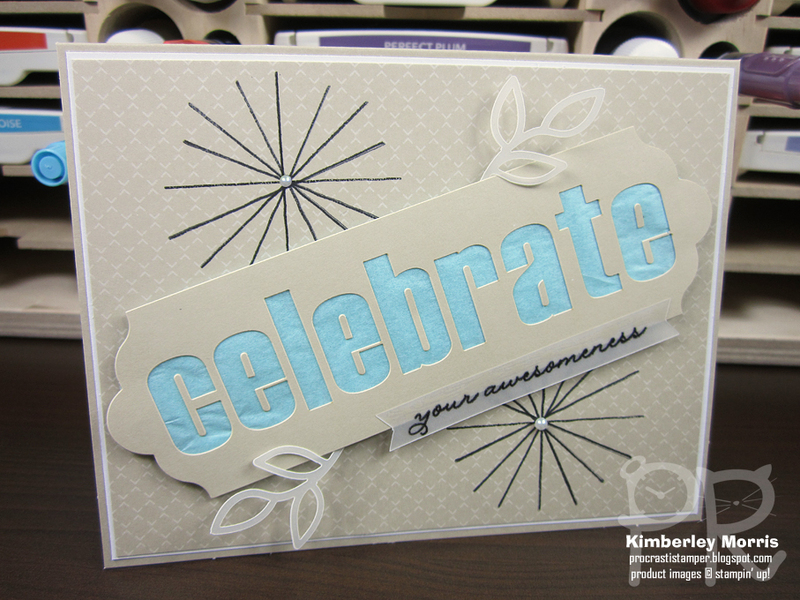 We stamped the greeting with the Soft Suede ink pad, onto Crumb Cake card stock, to match the card base. 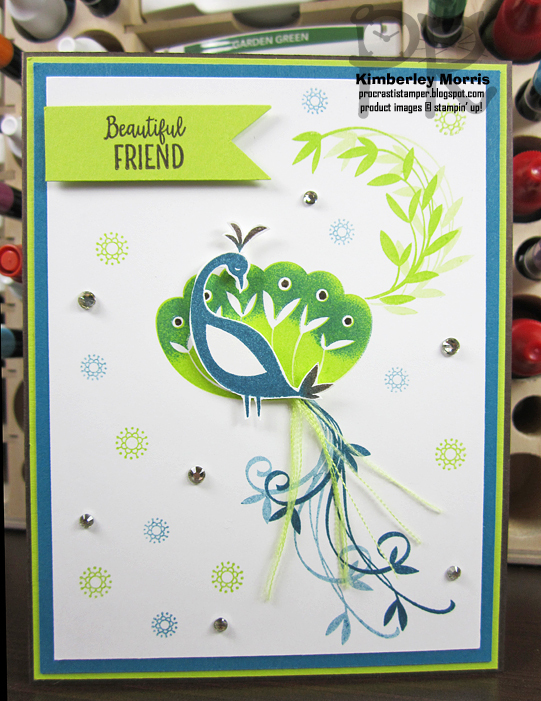 The green layer is Pear Pizzazz card stock, which was run through the Big Shot with the Petal Burst embossing folder. 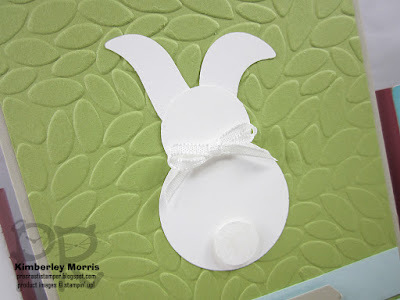 The bunny was punched out of Whisper White card stock with the 1-1/2" Circle Punch for the body, the 1" Circle Punch for the head, and the 1/2" Circle Punch for the tail. The bunny ears are the "tail" piece from the Fox Builder Punch. 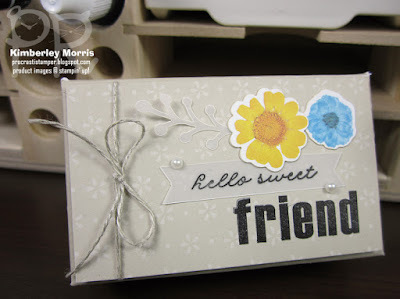 A wee little brushing of Clear Wink of Stella added just the right amount of glisten to the bunny tail, which was popped up with a Stampin' Dimensional. 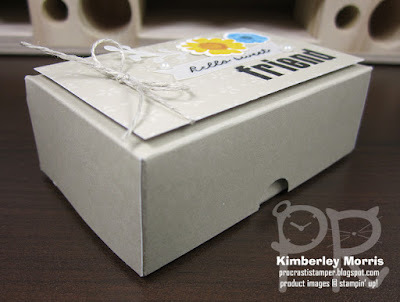 And the tiny bow was made from the delicate but sturdy Whisper White 1/8" Sheer Ribbon. 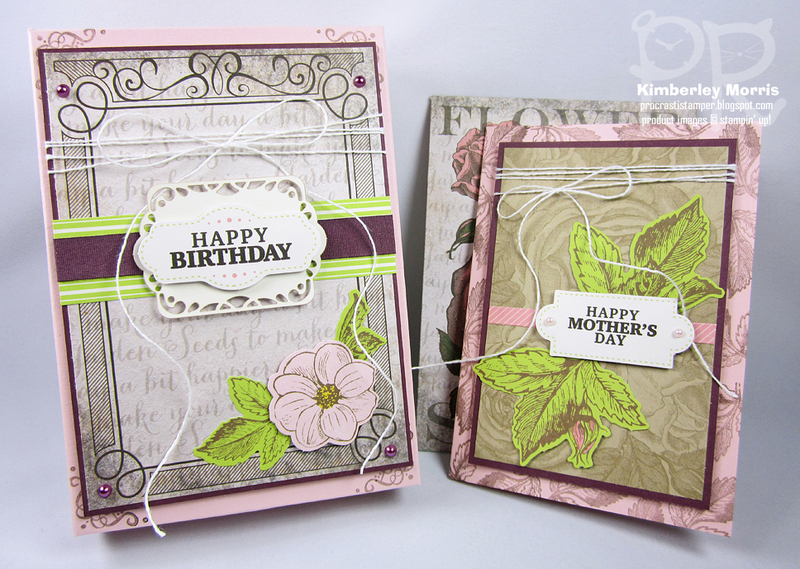 I also offered two different colors for the card stock strips at the bottom. 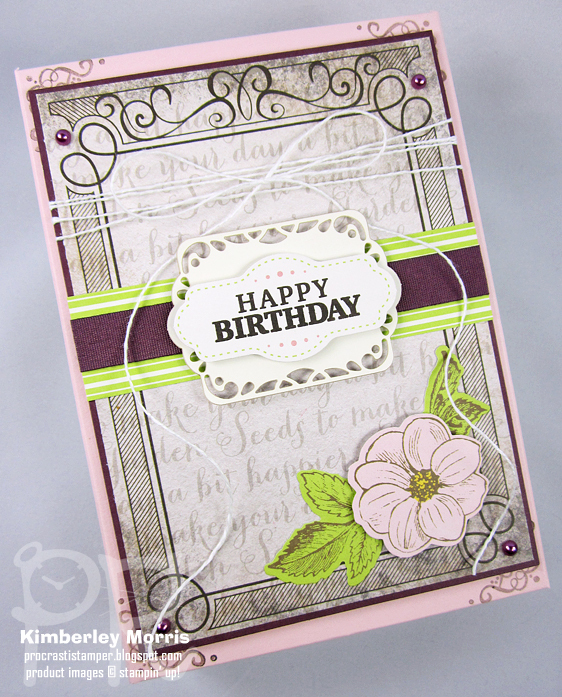 The color pictured is Soft Sky card stock, and the other color I offered was Pirouette Pink card stock. A couple of my class attendees chose one strip of each color. So Saffron card stock would also be a lovely soft color you could choose for those strips. I have to tell you, we have had the Teeny Tiny Wishes stamp set in our catalog for a LONNNGGG time, and we have a new catalog debuting at the beginning of June. Sometime next month we'll be getting a list of Retiring Items from this catalog, and it's always a surprise as to what's on it. Generally, a lot of the oldest stamp sets tend to drop off, so I would be sad--but not surprised--to see this set leave. 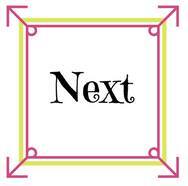 Now, you should also know that once that Retiring List comes out, the items on it start selling out fast...so right now is a great time to go through the current catalogs (2017-18 Annual Catalog and 2018 Occasions Catalog) and make sure you get the items you really want. ONE item that has the tendency to sell out lightning fast, is ink--especially reinkers. We already know that all five of the 2016-2018 In Colors are scheduled to retire: Dapper Denim, Emerald Envy, Peekaboo Peach, Flirty Flamingo, and Sweet Sugarplum. If you are interested in any of those colors, I strongly urge you to BUY THEM NOW...get the ink pads, reinkers, the marker set, and the coordinating card stock. You can browse all the 2016-2018 In Color items HERE in my Online Store. With Sale-a-Bration ENDING March 31st, THIS WEEK is actually the BEST time of the year to stock up on the products you've been eyeing for a while. You get to pick from a bunch of Level 1 Rewards for every $50 spend, or you can bank up and get Level 2 Rewards for each $100 spend! (you can also mix and match the levels with qualifying amounts) AND, if you're ready to stock up on a bunch of stuff so you can craft away the summer, keep in mind that with a $250 order you not only get to pick FIVE Level 1 Sale-a-Bration Items, you ALSO get an extra $25 in Stampin' Rewards, which would give you a total of $55 in FREE merchandise of your choice plus approximately $100 in FREE Sale-a-Bration Items! Seriously, if you're going to stock up and take advantage of that approximately $150 value for a $250 order, CONTACT ME. 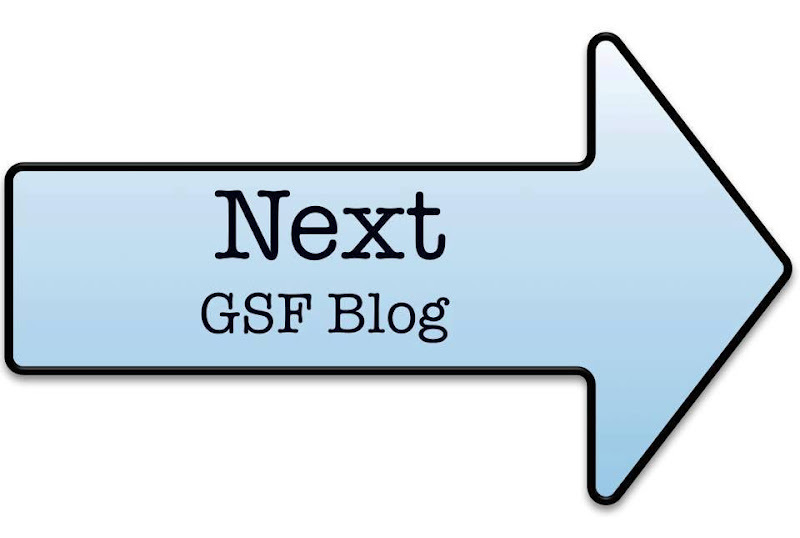 I can help you find what you really want, and get the most bang for your buck! 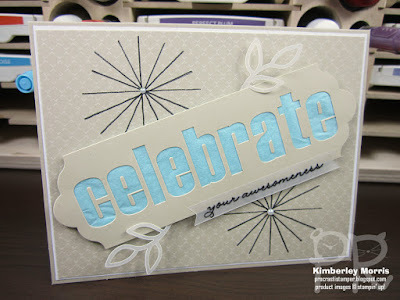 And don't forget to join me March 30th on my Facebook Business Page for my SIX Hour Sale-a-Bration Party!!! It's going to be a BLAST! Sale-a-Bration: Only 2 Weeks Left to Get FREE STUFF! You still have two weeks to take advantage of all the FABULOUS Deals! Check out my Sale-a-Bration post HERE for details...but the gist of it is that you get FREE STUFF when you SHOP, HOST, or JOIN! And finally, if you're a video lover, you can enjoy a playlist Stampin' Up! created, featuring several of the Sale-a-Bration FREE items, HERE. Welcome to the March 2018 Edition of the We Create Bloggers Step It Up Blog Hop! 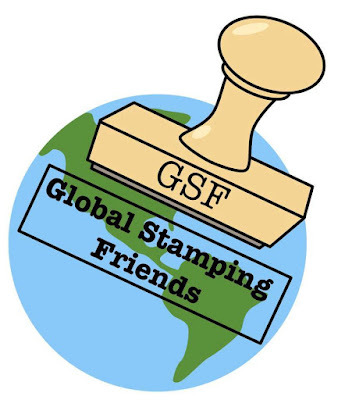 I'm sticking with our traditional theme for this post, which is to inspire stampers with a basic design, and at least one alternate "stepped up" version of that same design. 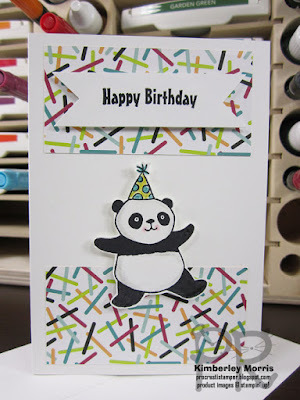 My projects this month feature the Party Panda stamp set, which you can get FREE with a qualifying order during Sale-a-Bration. 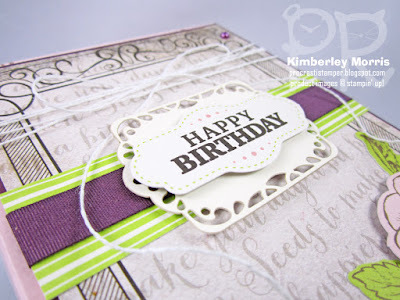 I've coordinated with a couple items from the Picture Perfect Party Suite, including the Picture Perfect Party Designer Series Paper, which I used on both my cards. I also used the Watercolor Pencils on both cards. On this card I used the pencils dry, to add color to the panda's party hat, cheeks, and to add shading. 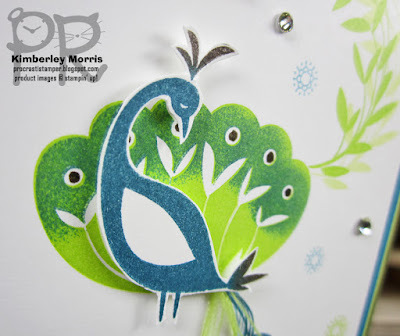 TIP: To get the "lime" color that matches the patterned paper, I lightly colored with the Old Olive pencil, then went over that with the Daffodil Delight pencil. 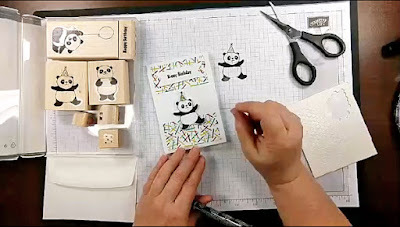 Stampin' Supplies: Party Panda stamp set, Whisper White card stock, Whisper White Notecards & Envelopes, Basic Black Archival ink pad, Watercolor Pencils, Picture Perfect Designer Series Paper, SNAIL Adhesive, Stampin' Dimensionals, Paper Snips, Stampin' Trimmer (to cut and score). 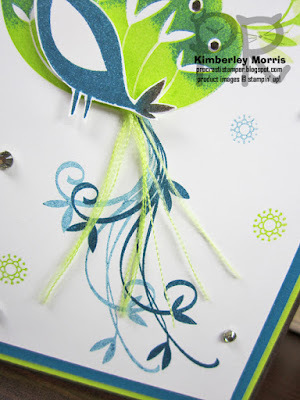 Below is my Stepped Up version of this card, with just a couple of simple changes. 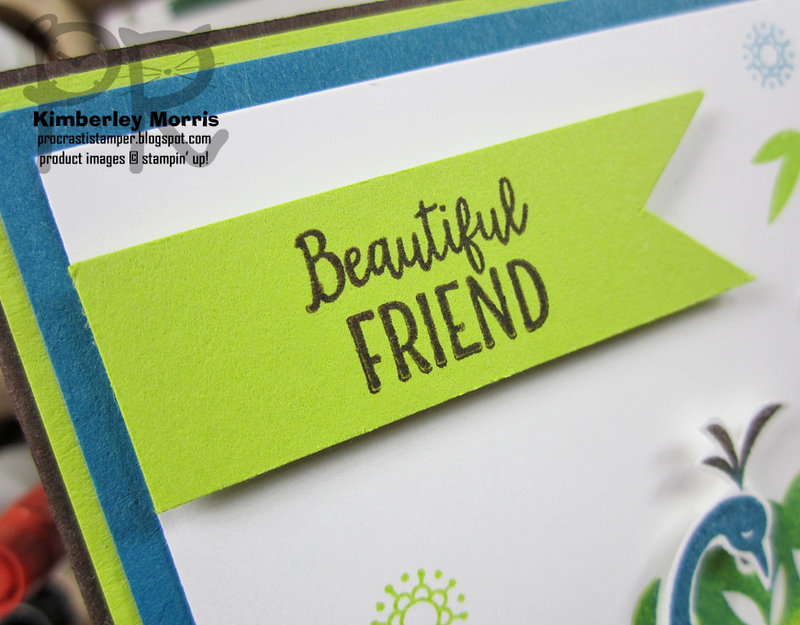 First, I added a layer of Bermuda Bay Card Stock, from the Picture Perfect Party Card Stock Pack, and also used it for the greeting banner. Second, I used Blender Pens to smooth and blend the Watercolor Pencil coloring. 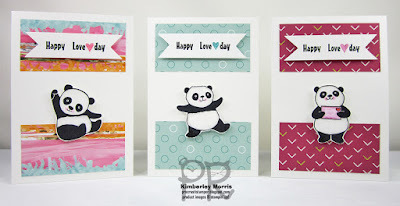 Stampin' Supplies: Party Panda stamp set, Whisper White card stock, Picture Perfect Card Stock Pack (Bermuda Bay), Whisper White Notecards & Envelopes, Basic Black Archival ink pad, Watercolor Pencils, Blender Pens, Picture Perfect Designer Series Paper, SNAIL Adhesive, Stampin' Dimensionals, Paper Snips, Stampin' Trimmer (to cut and score). 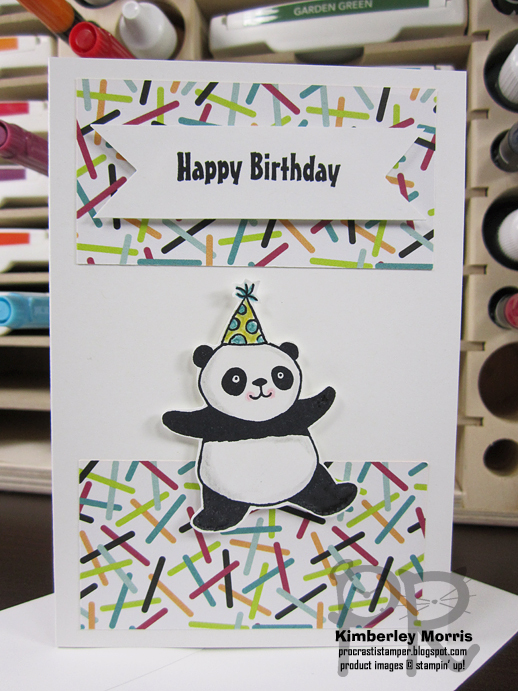 As I mentioned before, you can get the Party Panda stamp set (and/or other select items) FREE with a qualifying order during Sale-a-Bration when you shop my Online Store through March 31st! 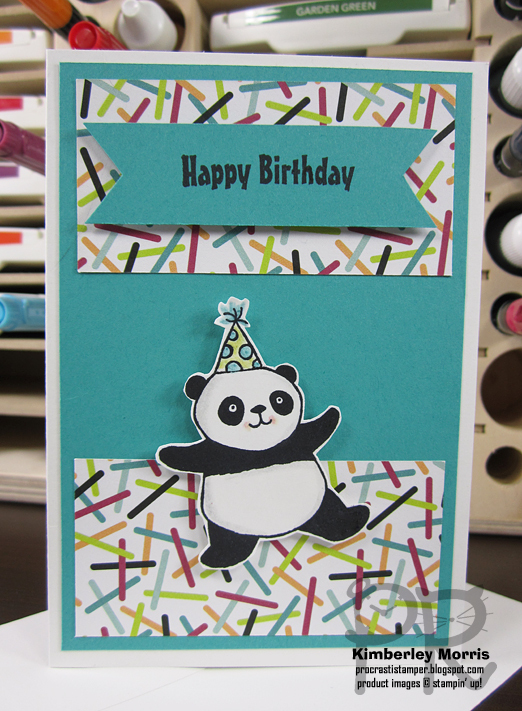 NOTE: Check out my previous post HERE, to see a different look with the Party Panda stamp set using these same supplies, but choosing different paper designs, and omitting certain features on a couple of images. I used the phrase "Happy Love Day" for Valentine's Day, but you could just use the "Love You" phrase from the stamp set instead, and create anytime love notes to tuck in a lunch or briefcase.